This weekend you can sing these lyrics in public and it would be socially acceptable, "Paul Newmans half Jewish; Goldie Hawns half too, Put them together--what a fine lookin' jew!" Adam Sandler's Hanukkah song is definitely one of the funniest songs ever and even though lighting the menorah may be fun, listening to that song is even more fun. Speaking of fun and singing, there are a lot of musical events this weekend celebrating the joyous holiday season. Why not get in the spirit, warm up your vocal chords and blast a tune or two with your family this weekend. The Little Orchestra Society invites everyone to take a trip to Toyland for the holidays with this updated production of Victor Herbert’s extravaganza, Babes in Toyland. 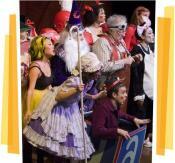 An array of beloved characters performs March of the Toys, Toyland and other favorite tunes. See the toys come to life this Saturday at 11:00AM. Tickets cost between $15 and $45. 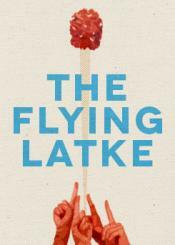 Usher In Holiday Fun with Yorinks’ zany classic, The Flying Latke. This book by Caldecott-Medal winner Arthur Yorinks, tells a heart-warming tale of Chanukah celebrations, holiday dysfunction and the miracle of a certain soaring potato pancake. Performers bring life to the story of the young Danny Silverstein and his “meshugge” family as they celebrate the first night of Chanukah. The show takes place on Saturday and Sunday at 11:00 AM. Tickets cost $15. Come ready to sing and dance your way into the Kwanzaa season with Harambee!, an interactive family performance of African storysongs and dances. Everyone is invited to share in this African-American holiday that celebrates family, community and culture. Hosts Kevin Nathaniel Hylton and Funmilayo Chesney will take you on a magical journey through the seven principles of Kwanzaa with traditional Congolese dance and mbira (African finger piano) stories and songs. The event takes place on Saturday from 12:30PM to 2:00PM. The admission is pay what you wish ($10 per family suggested). The annual Menorah lighting ceremony is a must for Jews and non-Jews alike. Brooklyn's Largest Menorah stands at a whopping 32 feet tall (the maximum allowed by Jewish law), and has been towering over Grand Army Plaza since 1985. The celebration is accompanied with live music and hot latkes for all. Special gifts are distributed to every child. Making this a family celebration and a must on everyone's calendar. The lighting and event takes place on Saturday at 7:00 PM. It is free for all to enjoy. The entire community is invited to a cultural celebration of Hanukah. The Kings Bay Y at Windsor Terrace will feature fun family activities including a glow-in-the-dark dance party with live DJ, a drum circle, storytelling, sing-a-long, arts and crafts, raffles and other activities for families. Free giveaways include: dreidels, glow sticks, latkes, and toys for the kids. Join the fun on Sunday from 10:30AM to 12:30PM. It is free for all to attend. 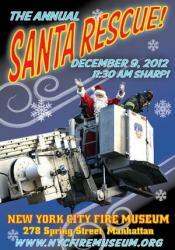 Watch FDNY firefighters rescue Santa from the roof of the Museum at 11:30AM sharp! Once safely inside, Santa will sit with children and pose for photos until 2:30 pm (don't forget your camera). Then on the 3rd floor loft, carols will be performed by The John Clacher Band. Snacks and hot chocolate will also be on hand to enjoy. 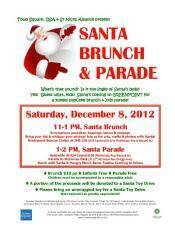 The Santa rescue and celebration taks place on Sunday from 11:30 to 2:30PM. The rescue is free. It is $10 for adults and $2 for children to visit Santa. Tickets are available through the New York City Fire Museum website. You and your family can enjoy a new look at some centuries old folk music, delivered by a high-octane mix of not-so-traditional Eastern-European Jewish and Turkish music. Led by harmonica innovator Jason Rosenblatt, one of the few people worldwide who can play the diatonic harmonica (a.k.a. blues harp). He is joined by trombone, drums, bass and clarinet. Shtreiml's 5-piece band has been labeled "explosive" and "exhilarating." Come for dance lessons at 1:00PM and stay for the musical celebration at 2:00PM. The event takes place on Sunday from 1:00PM to 3:00PM. The cost is $16 for adults and $12 for members. $12 for children and $10 for member children. There is a $2 discount for Holiday House Tour ticket holders. 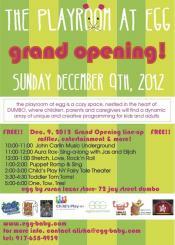 Come to the grand opening of the playroom at Egg. The playroom is a cozy space, nestled in the heart of DUMBO, where children, parents and caregivers will find an array of unique and creative programming for kids and adults. The grand opening day includes an Audra Rox sing a long, puppet fun, entertainment from Child's Play NY Fairy Tale Theater and more! The event takes place on Sunday from 10:00AM to 6:00PM. It is free for all to attend. You and your family can enjoy a Hanukkah family day together. You can construct a sculptural Hanukkah menorah with funky found objects—a Jewish Museum tradition. You can also create a colorfully patterned dreidel, dance to the tunes of Yosi and the Superdads and explore the Museum’s world-famous collection of Hanukkah lamps. The Hanukkah family day takes place on Sunday from 12:00PM to 4:00PM. It is free with museum admission. Even though the Hip Tot Music Fest is already awesome, they have made it awesomer by having Jeremy plays guitar and "the" BOB from Sesame Street, Bob Mcgrath. Come hang and dance with the people in your neighborhood (wink,wink) and enjoy arts n crafts, singing, dancing, face painting, local food and giveaways. The show takes place on Sunday at 2:00 PM. The cost is $12 for adults, $8 for children and non-walkers are free. You can also purchase a family pack (admits 4) for $35. Want to witness the largest amount of tubas you have ever seen and heard in one place? Great, then head over to the Ice Rink at Rockefeller Center for famous carols and fun. The TubaChristmas concert will express the respect and gratitude to all the composers who continue to embrace their instruments with their compositions and contribute to the ever growing solo and ensemble repertoire for tuba and euphonium. The concert takes place on Sunday from 3:30PM to 4:15PM and is free for all to enjoy.